0.1 What is a space heater? Almost everybody thinks that winter is a bad time, and it is the worst when the cold is perpetual. For many years space heaters have been a constant companion of every household in the colder areas. Therefore, having a heater that provides the best experience is a must for all. But in this modern age, when there are hundreds of brands in the market, choosing the best one becomes a tough work. 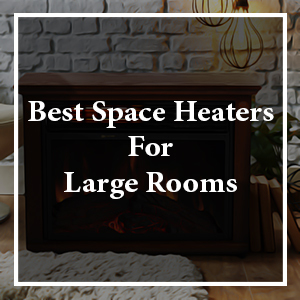 So, to ease your problem, we have come up with some of the best space heaters for large rooms that will suit your needs. The answer to this question lies in the word itself. This device warms up your surrounding environment and keeps you away from freezing to death in some cases. Space heaters are mainly powered by electricity or burnable fuels like gas, propane or oil. Space heaters are the most practical product in terms of affordability. If you live in a colder area, having a space heater is essential for saving your life. Space heaters keep your room warm and livable. And when you do not suffer in cold, you will always be in a good mood. Convection Space Heaters: If you are looking for a heater to warm up your room for a long period of time, I would suggest that you go with a convection heater. Most heaters are convection heaters. These types of heaters need circulation of the air in order to warm up the room. The cold air passes through the coil of the heater and comes out as warm. Since convection heaters heat up the air, the warmth tends to stay for a longer period of time. Also, these heaters make sure that the heat is distributed in the space evenly. 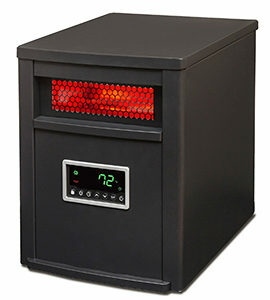 Radiant space heaters: Unlike convection space heaters, radiant space heaters are used to warm up a person or an object. The name “radiant’’ gives away how it works. It operates by emitting infrared radiation. The infrared contains energy which is absorbed directly by an object. Therefore, radiant heaters do not warm up the air of the room; rather they provide direct heat to a person. One of the basic advantages of using a radiant heater is that it warms you up very quickly, as the heat does not lose energy while traveling to you. Apart from that, space heaters can also fall into two categories depending on what kind of fuel they use to operate – electric space heaters and gas heaters. Electric space heaters: Electric space heaters are the type of heaters that use electric current to generate heat. Every electric heater uses a simple technique called “joule heating”. In this process, the electric current is passed through a wire coil, which is a resistor. The resistor then converts the electric current as heat energy. Gas heaters: As the name says, gas heaters operate by burning gas. There is a heat exchanger inside the heater. The heat exchanger is heated with gas combustion. The cold air is passed over this exchanger and warm air comes out. When it comes to choosing a radiant heater, Dr Infrared heater comes first in everybody’s mind. The new portable space heater is designed and manufactured in the US and comes with many breathtaking features. Auto Power Settings: This portable heater comes with three power settings – auto, low and high. The auto power saving mode lets you set your temperature from 50 to 80F. Then it selects to heat the room depending on the room temperature. 80,000 Hours of Operation: Another cool thing about the heater is its durability. Once bought, it can serve you for up to 80,000 hours. So, you can have warmth in your room for winter after winter. Quiet and Efficient Blower: Nobody likes anything too loud. Keeping that in mind, Dr Infrared Heater has come with a quiet yet efficient blower for the space heater. It is so quiet that you will hardly ever notice the sound. The blower can produce high pressure and move a large amount of air at a lower speed. In this way, it delivers heat in no time, without making any noise. Cons: Since it is an infrared heater, it will only warm up the objects in the room, not the whole room. 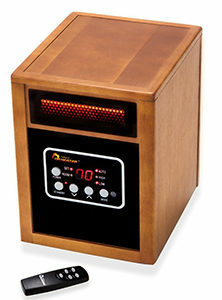 Dr Infrared Heater Portable Space Heater is one of the best space heaters you will ever come across. As they have put correctly, “they just understand heat transfer better”. When anybody looks for effectiveness and efficiency both in a heater, DeLonghi is their first choice. For many years this company has been serving people with home technologies with a sense of comfort and reliability. And with the DeLonghi EW7707CM, it is no different either. Comfort Temp Technology: This technology is one of its kinds provided by the DeLonghi. Comfort Temp technology makes sure that optimal heat is served while maintaining a low temperature. In this way, you can save up to 27% on your energy bills. Oil filled radiator: Another cool feature of this model is its oil filled radiator. It saves you from maintaining your heater once in a while. The oil system is sealed for good. Therefore, you will never have to think about refilling. SafeHeat Technology: Like many cool heaters, DeLonghi EW7707CM uses safe heat technology. It’s a safety feature that uses the thermal shutdown of the heater if it ever gets overheated. For that reason, it is a perfect family heater. You will not have to worry about the heater bursting and causing the fire. Patented smart-snap wheels: DeLonghi EW7707CM Safe Heat 1500W uses patented smart-snap wheels. It lets the user move it from one place to another, making it portable. Therefore, you will not need to reassemble the heater for moving it. Just use the wheels. Cons: They only give warranty for one year. But you need not to worry about it. Their product is so durable that you can spend a lifetime without worrying. De’Longhi is famous Italy based manufacturer of home appliances. One of their specialty is their amazing heaters. Once you buy DeLonghi EW7707CM, you can stop worrying and enjoy the warmth for a very long period of time. Another leader in the space heater industry is Lifesmart. Every Lifesmart product gives you a sense of reliability, and this heater is no different. 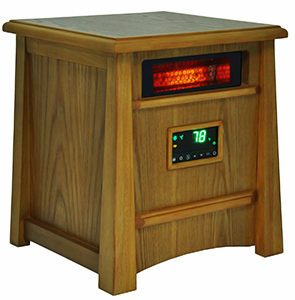 Made in the USA, Lifesmart Large Room 6 Element Infrared Heater comes with numerous unique features. 3 heat setting: This amazing heater lets you have 3 energy saving setting, including one Eco Setting. This Eco setting can heat your room to 68 degrees Fahrenheit using only 500 watts. From this, you can understand how energy efficient this heater is. 12-hour timer: The unique feature of this model is its 12-hour timer. You can turn off or on your heater 12 hours ahead. Therefore, you will not need to wake up at morning to turn off your heater or go from one room to other just to turn it on. Just set the timer and the heater will do the rest. 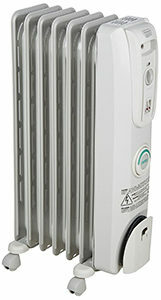 E Z Glide casters: This heater uses E Z Glide casters. If you do not know what this is, it makes moving the heater from one place to other very easy. Therefore, Lifesmart Large Room 6 Element Infrared Heater is portable. Cons: Their warranty is only for one year. Other than that, it is a great product. It is a great model for zone heating. With Lifesmart Large Room 6 Element Infrared Heater, you can heat up part of your home which you use only. Therefore, it is an amazing heater for reducing heat consumption. This Eden pure model is suitable for any kind of space. It is an infrared heater, which means that it will directly warm up objects and persons, without losing heat in the air. Electric thermostat: The most amazing feature this model offers is its electric thermostat. Do you worry about the heater causing a fire? Well, don’t. This electric thermostat makes sure that the temperature is never high enough. For this reason, it is perfect for the home environment. The new digital function can automatically on or off the heater when needed. Remote control included: Like many other good heaters, EdenPURE A5095 Gen2 Pure Infrared Heater also comes with a remote control. This remote control has an upgraded version which includes High-efficiency particulate air (HEPA) filter. 2-year warranty: This model gives a warranty for 2 years. I mean, that’s amazing. You can be worry free for a long time with this model. This heater also exceeds the expectation and will run for a lifetime. 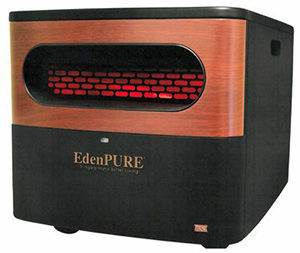 Space saving design: Unlike many heaters, EdenPURE A5095 Gen2 Pure Infrared Heater is lightweight and easier to move. Therefore, it is applauded, my numerous customers. Cons: EdenPURE A5095 Gen2 Pure Infrared Heater is designed specifically for saving space and energy. Therefore, it is not very efficient for extra-large apartments. This heater is also very stylish in look. It comes in black color which gives it an aristocratic look. This is one of the best space heaters. If you have a small house, I would suggest that you buy this one. Do you want a heater that serves your need and also cool looking? Well, This Life Lux Infrared heater is your answer. A mixture of style and energy efficiency is what this heater offers. It is so efficient that it can provide heat for an extra-large room. 3 Heat Settings: Like many best space heaters, this Life Lux Infrared heater also comes with 3 different heat settings for your different mood. It has a 500-watt Eco setting with a 12-hour start and stops the timer. The eco setting lets you control the temperature up to 68 degrees. You can also set a timer from 1 hour to 12 hours and the heater will automatically start or shut off. You will never have to get up to turn it on/off by yourself. Stylish all wood Oak Stain Cabinet: The best feature of this heater is its exterior. It is surrounded by a stylish all wood oak cabinet which is safe to touch. Therefore, it is also safe for the home environment. New larger remote control: All the functions provided by the heater is digital and remote control. The heater has a digital thermostat which makes sure that your heater does not get overheated. Cons: Since it is an infrared heater, it is efficient for heating for a shorter period of time. Other than that, it is one of the best space heaters in the market right now. This stylish looking space heater is applauded by numerous critics and consumers. It is very cheap considering the fact that it is designed for extra-large rooms. With one Life Lux Infrared heater, you can spend a lifetime in warmth and never have to suffer in cold. Inexpensive to purchase: Portable space heaters are some of the best economic decisions a buyer can make. They are very inexpensive in terms of cost saving and significantly reduces your heating bills. The technology of heating is really simple. Therefore, space heaters do not have complicated mechanics. For this reason, they are also affordable to purchase. Quick heating: One of the basic advantages of a large space heater is that it can quickly warm up your surroundings. Radiant or infrared space heaters heat people and objects directly. It is the most efficient way to warm up something. Easy to install: As we have discussed earlier, space heaters do not use complex mechanics. Therefore, they are really easy to install. It is not rocket science. After buying a space heater, you can install it yourself, if you have the installation manual. It’s portable: Another great advantage of these heaters is that they are portable. Most space heaters use E Z glide caster that helps you to move the heater from one place to another, without reassembling it. So, no matter which room you want it to be in, you will not face any difficulty. Before buying the best space heater, the first thing you need to consider is the size of the room. Is the heater efficient enough to cover the whole space? Is your room to small? These are the questions you need to answer before buying a space heater. Because buying a large heater for a small room will be just money down the drain. Think about what kind of fuel the heater needs. Is it an electric or a gas model? You also need to consider which kind of fuel costs less. Before buying a space heater, make sure you read the installation manual. From that, you will have a clear idea about how to set up the heater and what should be done to set a heater up. Some heaters are wall mounted, while others are floor mounted. You need to check it before buying the best space heater. If you do not have enough space on the wall, then a wall mounted space heater is probably not a right choice for you. Also, if there is no option on the wall to plug the heater in, then it will be futile to buy a wall mounted space heater. Check whether your heater has a thermostat. Thermostat lets you know if the heater gets overheated. They also make sure that you have an optimal temperature. Like many electric devices, space heaters also make some noise. It is mainly because of the fan inside the heater that circulates the air. Make sure that your heater makes minimum noise. Many models also have features like an oil-filled radiator for silent operation. You can consider those models for your home or quiet environment. One of the most important things to consider before buying a large space heater is whether the heater has a temperature control system. Many old models do not have this feature. But almost all new heaters come with this feature. Make sure you buy one which lets you control the temperature digitally. Every good space heater has a feature that lets you set the timer. It is essential because it eases your monitoring and controlling the heater. The timer also helps you minimize cost because if you set the timer, the heat starts or stops according to your time, without running for all day long. The design of your preferred heater is an important factor you must consider. Not every heater is designed for the home environment; some are designed for commercial purposes too. So make sure you find the most suitable one for your home. You also need to check if the heater is designed to be mobile or not. 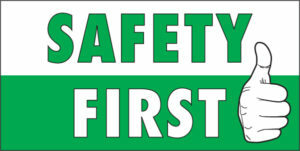 If you do not monitor your heater properly, chances are the heater will burst and cause a fire. Therefore, always look for a heater that is safe and sound for your home. Read the manual before buying, ask whether the heater has a sensor that can detect overheat or not. Also, check whether the heater has a cool-to-touch feature. These are the safety features that you need to consider while buying a large space heater. Warranty is an essential factor for consideration. Not all large space heaters come with a long warranty. You need to make sure that the heater you are going to buy gives a warranty for a longer period of time. Warranty shows the durability of a product. It also says that the company is confident enough about its product. Always read the instruction and warning labels on the heater carefully. Turn off your heater before going to sleep, or set a timer for the heater to turn off. Make sure you buy a space heater that is certified by a testing laboratory. Proper placement of your heater is a must. Make sure anything burnable is not hear the heater. Always keep your heater on a safe distance from infant and children. It is better to set up a smoke alarm on your house. This is recommended by every organization. Never place your heater on cabinets, furniture or carpet. It is very risky because then there is a chance that heater will get overheated and cause fire on them. Well, buying a space heater is not a difficult task once you have a clear idea about the features of the product. There are numerous brands of heaters that offer a variety of features according to customers’ demand. All you need is the information about your home and what you need – and you will find the heater suitable for you in no time. So, what are you waiting for! Just go to the market, buy your preferred heater and say goodbye to cold weather.